The Cook sisters at Fenway Park. 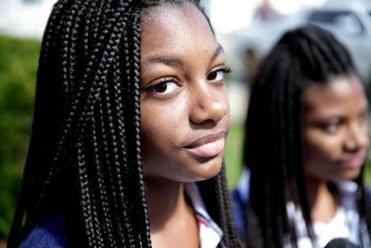 Black students at a Malden charter school who wear their hair in braids are facing detention and suspension by administrators who say the hairstyles violate the school’s dress code. Parents describe the crackdown as racist. 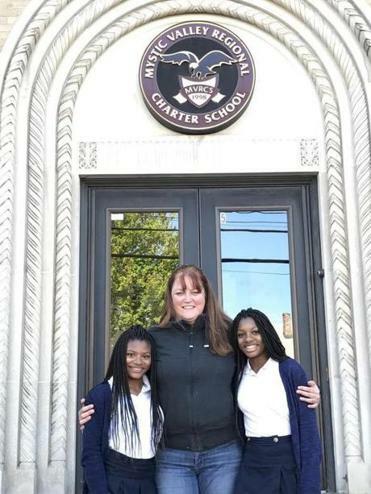 Colleen Cook, whose twin 15-year-old daughters, Deanna and Mya, attend the Mystic Valley Regional Charter School, said Thursday evening that her children have served multiple detentions since last week and could be suspended. Two other mothers said their black or biracial children had been subjected to discipline or questioning over their hairstyles — braids with extensions — which the parents describe as important expressions of culture. The school issued a statement defending its actions, saying that Mystic Valley Charter serves a diverse population and that many students go on to attend top colleges and universities. Deanna Cook, 15, mother Colleen Cook, Mya Cook, 15. Mystic Valley Regional Charter School disciplined black and biracial students because of hairstyles that violate the school’s dress code policy. “One important reason for our students’ success is that we purposefully promote equity by focusing on what unites our students and reducing visible gaps between those of different means,” the statement said. School officials were not available for interviews Thursday evening, a spokesman said. Cook said the school’s policy against braids that include hair extensions — additional hair that is woven in — disproportionately affects black children. Cook and her husband adopted five black children — all siblings — and four have attended Mystic Valley since kindergarten, she said. 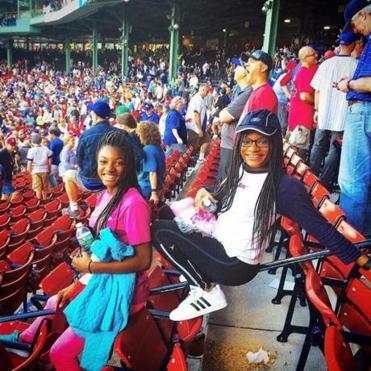 Cook said her two daughters who are facing discipline for their hairstyles are good students: Mya is in the National Honor Society, with a 3.79 grade point average, while Deanna has a 3.3 grade point average. More than 40 percent of students in the school are people of color, including 17 percent who are black, according to the latest annual ranking from U.S. News & World Report. Cook said she has called two civil rights groups — the NAACP and the state’s Anti-Defamation League — seeking help. The Anti-Defamation League, a nonprofit organization that fights anti-Semitism and other expressions of hate, has set up a meeting with school administrators on Friday, Cook said. Officials with the Anti-Defamation League could not be reached Thursday evening. The punishment for some other girls of color at the school has been even more severe. Annette Namuddu said she received a call from school administrators last week saying her 15-year-old daughter, Lauren Kayondo, initially would have to serve detention. When her daughter refused to remove the braids this week, the detention became a suspension, the mother said. “I don’t get it,” Namuddu said. Namuddu said her daughter has been coming home from school and crying, saying she feels the school is picking on black children. Kathy Granderson said her 14-year-old daughter, Jaden, a freshman at the school, was one of about 20 girls taken down to administrators’ offices last week and asked whether their braids contained any “fake” hair. Granderson said about half of the girls ended up getting detentions, but her daughter, who is biracial, did not.